Today, we’re looking at Volkner, who made another appearance in SM Ultra Prism. The last time he appeared, he had a card called Volkner’s Philosophy from Platinum Rising Rivals. The effect was to discard a card from your hand, and then draw cards until you have six cards from your hand. This new Volkner still has the Ken Sugimori artwork with the same Sunyshore City Gym background, but the effect is unrelated. 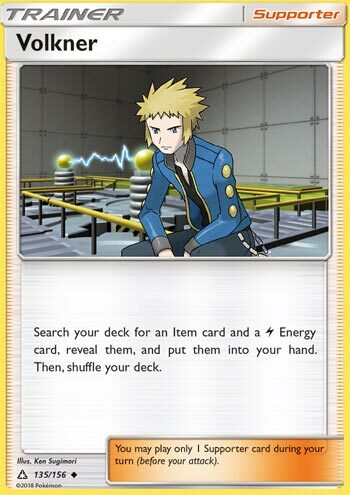 This one states that you search your deck for a Lightning energy card and an item card and put it into your hand. Volkner is in a similar proposition to Korrina, fetching certain targets to advance your game plan, and was worth your Supporter for your turn. Like both, Volkner and Korrina can fetch item cards, ready to be used in the same turn. Korrina, however, fetches one Fighting Pokemon, which may regulate her to being a staple on one deck and being useless on others. Volkner also fetches a Basic Lightning energy, which is a bit more flexible than Korrina: a staple for lightning centered decks, loose staple on certain decks whose Lightning energy somehow meets lightning and/or Colorless energy costs, and still useless on others (Volkner would be slightly weaker than Skyla instead in this case). When it comes to either combos or strategies, there are a lot of applications of what Volkner can do for you. The Lightning Energy is a given, you’ll be using it for manual attachments, Magnezone BKT Magnetic Circuit ability, or discarding from your hand to pay for certain attacks. As for items, this is where the possibilities are endless. I won’t pinpoint every single detail, but to give you an idea. Ultra Ball to fetch Pokemon, VS Seeker to recover Supporters, Professor’s Letter to get even more basic energy (which may seem like the equivalent of Cilan), Pokemon Catcher to snag a certain threat that you want removed, Max Potion or Super Scoop Up for saving your Pokemon, any of the 13 Ace Spec cards especially Computer Search, and much, much more! You can even fake Volkner as draw power by fetching and using Ultra Ball to get a Shaymin-EX (XY Roaring Skies) and have a hand of six cards. You can also fake disruption power by fetching a Red Card (XY) and mess up your opponent’s hand. So I’ve just listed a bunch of examples of what cards to pair with, but some of the cards that I’ve mentioned are usable in Expanded because Standard doesn’t feature too many cards to combo well with. The card pool of what’s available in Standard and Expanded will affect how much use Volkner is going to get. I still stand firm that Volkner will see good to great usage. However, Expanded faces fierce competition among other supporters despite having a much greater card pool in regards to item cards that I’m just going to eyeball it and call it even. Grabbing two cards that you could actually use in the same turn (if applicable) is a bargain! In Limited, Volkner is a must run unless your deck doesn’t use Lightning energy or items. The item roster in the SM Ultra Prism set, unfortunately, doesn’t seem to be worth using. Escape Board would probably be worth fetching and using in the Limited Format if you really want to use Volkner. Other item cards are too specialized like the memory cards and Ancient Crystal. Notes: Korrina is a good role-model for cards that provides a two-for-one deal, that is, two effects/cards for just a single slot of your card deck. When it works, they can be amazing in few decks; when it doesn’t, then there are other options. Volkner is just sort of there, doing a good job when you need it. It would be insane for me to ask, but if Volkner fetches any type of Basic Energy cards, then it would almost be universally used! Volkner (UP 135) jolts into the meta from the Ultra Prism expansion set. This Supporter card allows you to search your deck for a Lightning energy and an Item card. Yes… sigh … that’s it. It’s a marginally better Skyla. That’s why almost no one has played it since it debuted almost two months ago. Of all of the top finishers in events played between February 17th and March 17th, only Rafael Bascope (4th place at La Paz March 10th) played a single copy in his Hoopa, Xurkitree, Wishiwashi deck. To rub salt in the wounds of poor Volkner, 42 copies of Skyla were run during that same time frame. I could go on about how it would be so much more useful if it let you grab an Item and two Basic energy of any type. Or Two Items. Or an Item and a Pokemon like Korrina used to. Korrina was pretty broken. I used to run a Garchomp Gallade deck when I first started playing two years ago, and Korrina was my engine. It was a fun deck and it did really well against EX Pokemon. But I digress – Volkner just isn’t a good card, it’s just another example of Pokemon underpowering a card that they could have made just a little better to add flavor to our meta. To give you some perspective, 89% of the top finishers in events played between February 17th and March 17th ran a total of six different Supporters. Yes, there were 2397 Supporter cards played in the 171 decklists I had available to analyze, and 6 different cards made up 2139 of those 2397 (Guzma, N, Cynthia, Brigette, Sycamore, and Acerola). That tells me that it’d be nice to have a couple more usable Supporter cards. Unfortunately, Volkner just isn’t one of them. In case you’re wondering where I pulled those stats from, I did a pretty extensive analysis of all of the cards played in events between February 17 and March 17 here on PDC. I tried to post it here on Pojo but was having trouble with the Publish to Web functionality. When we figure that out, I’ll definitely post it here as well because it’s a significant work that I really want to get as many eyeballs on it as possible.